I run my own Exchange 2007 server, which requires an SSL certificate to enable all functionality (like syncing to my iPhone). A few days ago, my SSL certificate expired so I renewed it and installed the new one. As soon as I did that, I could no longer sync my phone or use Outlook Web Access (OWA). In fact, I got a “Page Not Found” error when navigating to the server using “https”. The solution to the problem turned out to be simple, but it took me a while to figure out. 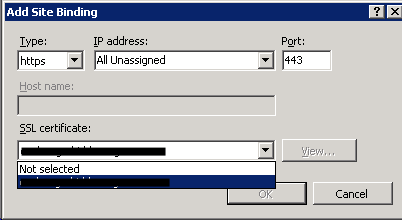 Mainly because I haven’t done a lot of configuration on IIS 7, as the place I’m currently consulting at uses older technologies like IIS 5 and IIS 6 (government work…it isn’t always bleeding-edge, by a long shot, but it can be stable…). 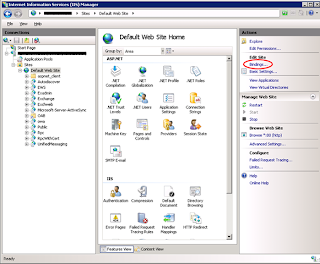 IIS 7 gives you the option to bind an SSL certificate to each website. My old certificate was bound to the Default Website, and when I deleted the certificate the binding was obviously removed. When I installed the new certificate, I forgot to rebind it. So here’s how you do it. Next, click on “Bindings…” on the right-hand menu. This will bring up the site bindings menu. If you still have the old https binding listed here, click “Remove” before proceeding. Trying to edit the old binding can be problematic and doesn’t always work. 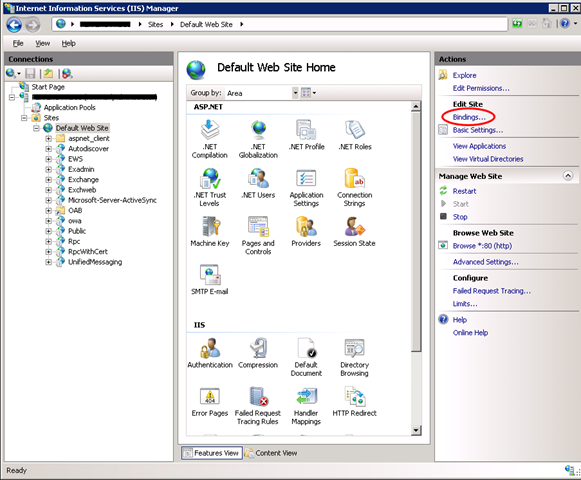 After that, click “Add…” to bring up the “Add Site Binding” dialog. Wow, two posts in one day! Not much else to do while I sit here watching people tear out our old carpet and install new carpet. Everything's unhooked and has been moved out to make room, so it's just me and my laptop for the rest of the day. I find myself looking up the syntax for these shortcodes pretty often, so I thought I'd post it. What's a shortcode? It's like an HTML tag, but using square brackets instead of angled brackets. Wordpress interprets them as shorthand for doing something more complicated. They can be very handy, so check them out if you're not already familiar with them. Here is the list of shortcodes supported by Wordpress. Create the object in memory. Attach it to the current context, using either InsertOnSubmit() or InsertAllOnSubmit(). Submit the context, using SubmitChanges(). Assuming that there were 10 records in the table prior to executing this code, the value of count in line 13 will still return 10. 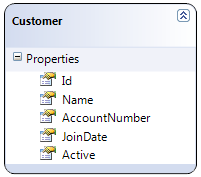 This is because even though newCustomer is attached to the context, LINQ will not “see” it when you query until it has been submitted. Instead of adding it directly to the context, if you add it to the Entity collection of another Entity, like in the following example, you would have the exact same results. Now, the count in line 14 will return 11 instead of 10. It’s a fairly simple concept, but when you’re writing complicated code sometimes that’s the exact type of thing you can overlook. Unfortunately, I haven’t found a way to actually query what LINQ has pending for submission. If anyone has ideas, please let me know! This is a handy little tool for anyone creating or maintaining websites or blogs (which isn't just developers these days). Yahoo! has a free web-based tool called Smush.It that will convert any JPG, GIF, or PNG file to a smaller, more compressed version. This means faster downloads and lower bandwidth requirements for your site (and $$$ savings, depending on your hosting service). Plus it's just plain nice to do for your site visitors - nobody likes waiting around for pictures to load, especially on slower mobile devices. Smush.It can achieve up to a 70% reduction in some cases, without any quality loss. Not bad for free. I’ve been less than pleased with Wordpress.com’s facilities for posting source code. The built-in shortcode sourcecode isn’t too bad, but it’s hard to control through custom stylesheets. For me, I found the font size too small and hard to read. Also, it doesn’t always highlight the syntax the way I want. So here are a couple of solutions that worked for me. CopySourceAsHtml – this is a add-in for Visual Studio 2005, 2008, and 2010. It lets you copy code into your clipboard as HTML from Visual Studio. This is nice and easy, but only if your code is coming from Visual Studio. Windows Live Writer – this isn’t strictly for posting code, but an all-purpose blog editor that works with a lot of different blogging systems (including Wordpress.com). It’s much easier to use than the built-in Wordpress.com editor. You can get it here. It also accepts plug-ins, like the Source Code Formatter. WLW Plug-in: Source Code Formatter – a plug-in for Windows Live Writer. It let’s you customize the style, such as font, color, box outline, and alternating shading. You can also set select lines to be highlighted. It’s reliable, easy to use, and isn’t dependent purely on Visual Studio. Both of these solutions generate <pre> tags, but it’s possible that your Wordpress.com theme messes with that tag and thus makes your code unreadable. If that’s the case, you can simply append your CSS style sheet with the following to “reset” your <pre> tag style. The exact style you set it to is not that important, because the source code HTML you paste in should override what it needs to. It just needs to “undo” anything your theme’s CSS might be doing. Note that you will need the CSS Upgrade in order to do this. 1. Keep it short. I lost count of how many resumes had 12-16 pages, and these were for developers with 7-8 years of experience. There's no reason that resume should be more than 2-3 pages, max. 4. User proper spelling and grammar. I can overlook a single misspelled word, but I saw literally dozens of resumes that each had at least 4-5 mistakes. Make sure your sentences make sense, use consistent verb tenses, and are complete. Not doing this consistently shows me that you're not a detail-oriented person, and therefore not someone I want to hire to write code. I used NUnit for the first time in this position, which gave me an opportunity to learn something new. The problem was, that position only started 4 months ago. So either this person was a liar or they can't do simple math. Either way, I don't want to hire him. In the system we're currently developing, most database records have temporary copies that we refer to as shadow records. A shadow record is a temporary copy of a database record that is used for editing until it is "approved", at which point it gets copied to the real record. Shadow records are identical to the actual record, but with a different primary key. They are stored in the same database table as the real records. Those tables have a foreign key relationship to themselves from a shadow source column to the primary key column. 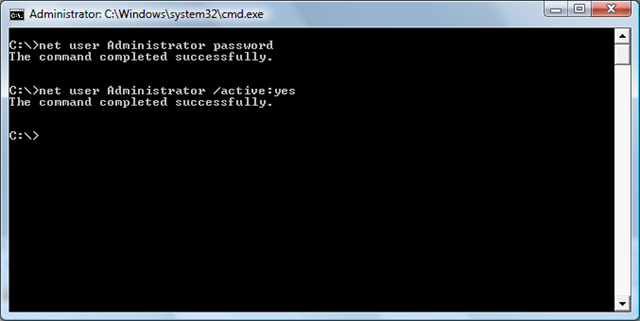 For example, one table is Address. 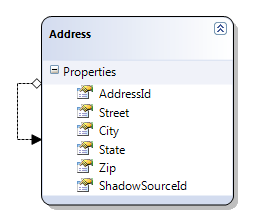 In addition to all the columns that represent the address information, there is the AddressId column and a ShadowSourceId column. The ShadowSourceId is a foreign key to the AddressId in the same table. Rows with a null value for ShadowSourceId are approved records, while rows with a value for ShadowSourceId are shadow records. then the ShadowSource EntityRef will have the expected value. However, now the ShadowSourceId property will contain a null. While this seems redundant, sometimes it's necessary. In my situation, I didn't need to submit my changes because this was a unit test for a small piece of the process. If you need both of these to be available, then you'll need to decide which solution is the most appropriate in your situation - submitting your changes or simply setting both manually. Welcome to the Code Connection! In this blog, I will focus on practical applications of programming, as opposed to more theoretical topics. My focus will be primarily on C# and .NET, but other topics and technologies may come up from time to time. Please don't hesitate to share you comments and suggestions - I look forward to them!